Senior basketball players took the court one more time representing their schools in several All-Star games over the week. Monday night the annual Lackawanna League Senior Girls All-Star game took place at Forest City. Players throughout the league’s four divisions were placed on the team rosters. The Red team featured Blue Ridge’s Danielle Goff, Mountain View’s Sydney Newhart, and Montrose’s Harper Andre. The Blue team had Susquehanna’s Bethany Maby, Sarah Korty and Maggie Kowalewski from Forest City. After exchanging leads early, a Goff bucket midway through the first quarter put the Red team on top to stay. Newhart scored her only points during a run that put the Red team ahead by double digits and assumed a 31-22 halftime lead. They extended the lead to 15 at the end of the third before the Blue team rallied in the fourth erupting for 23 points and cutting the lead to 62-61 before Red went on a 6-0 run and prevailed 72-68. Goff had 7 points for Red and Newhart added 2. Maby scored 7 for Blue and Korty chipped in with 3. During the pre-game skills competition, Kowlewski nailed 10 three-pointers in 45 seconds to win the competition. 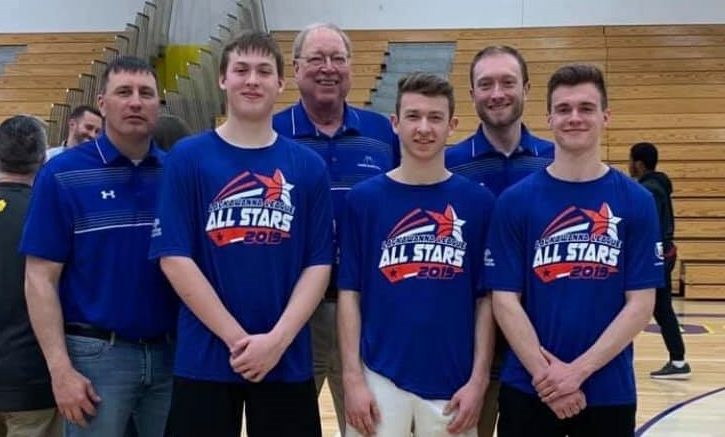 Tuesday’s Boys All-Star game, held at Valley View, not only featured local players but also their coaches. Susquehanna’s Lawrence Tompkins coached the Blue team with Saber players Susquehanna’s Bryce Baldwin, Canyon Stone, and Mason Deakin. Mountain View Head Coach Joe Gibbons led the Red team that featured Mountain View’s Mikey Schermerhorn, Elk Lake’s Hunter Bomboy and Blue Ridge’s Sam Cosmello and Kaleb Folk. The Susquehanna crew helped the Blue team build a 73-48 lead at halftime as Abington Heights senior and Binghamton University signee George Tinsley led the way scoring 20 of his game-high 30. But the Red Team rallied in the second half outscoring the Blue 74-52 and taking a 117-114 lead when Mountain View’s Mikey Schermerhorn nailed a three-pointer. MVP March Kudrich of Valley View hit a pair of threes as the Blue pulled ahead 122-119. Holy Cross’s Tyler Mozoleski knotted the game with a three pointer and set up the game’s final play. Kudrich dribbled to the right wing and pulled up to hit to the game-deciding three as the Blue prevailed 125-122. Elk Lake’s Hunter Bomboy was high scorer among the locals connecting for 9 points for the Red team. Schermerhorn added 8 while Cosmello scored 4 and Folk chipped in with 3. Baldwin had 7 for the Blue Squad and Stone added 4 and Deakin chipped in with 3. 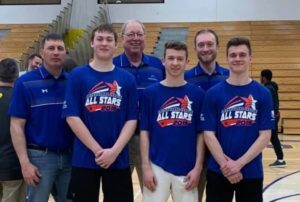 Five days later Schermerhorn participated in the Battle of the Valley All-Star game that featured the top seniors of the Lackawanna League pitted against seniors from the Wyoming Valley Conference. Schermerhorn failed to score but he and his teammates defeated the WVC 105-94. “It was real intense and more like a real game,” Schermerhorn said. Be the first to comment on "Seniors play in all-star games"